Offering substantial cost savings in comparison to alternative systems. safeticurb is a long established. 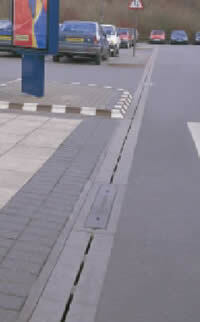 well proven linear drainage system with a discrete cross-fall to direct surface water to drainage entrance for hard landscaped areas and roadways. 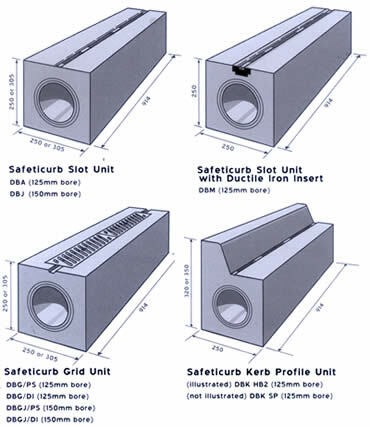 With slot, grid or intergrated kerb options, sateticurb offers a cost effective alternative to gully networks, substantially reducing the need for expensive underground connecting pipework by directing surface water to the drainage entrance. Long established and well proven. safeticurb has shown itself to be effective, durable and requiring minimal maintanance, suitable for all hard-landscaped surfaces and heavier duty options such as industrial sites. profile option with slot inlets.